"I asked him whether, given how much money he made because of a vaccine, he is the best person to advocate for vaccine. Even if we assume he's never done anything improper, does he have the credibility to convince the public? He says yes, because he has the knowledge of how vaccines are tested and created, because he's been behind the curtain at pharmaceutical companies — things a strictly academic scientist wouldn't have access to. He admits his vaccine made him wealthy, but he says he spent 25 years trying to develop it because he wanted to save kids." "Asked whether any specific facts in the story were wrong, he said it was primarily the tone he objected to. But he did say that the hospital owns the patent, not him (though he received a share of royalties from it). Also, when Attkisson noted that he had been quoted as saying children could safely take up to 10,000 vaccines at once, "what I actually have said is at least 10,000. It's probably closer to 100,000." Oh, so it's actually 100,000 vaccines a kid can tolerate? "A London researcher was the first to assert that the combination measles-mumps-rubella vaccine known as MMR caused autism in children. Following this "discovery," a handful of parents declared that a mercury-containing preservative in several vaccines was responsible for the disease. If mercury caused autism, they reasoned, eliminating it from a child's system should treat the disorder. Consequently, a number of untested alternative therapies arose, and, most tragically, in one such treatment, a doctor injected a five-year-old autistic boy with a chemical in an effort to cleanse him of mercury, which stopped his heart instead. 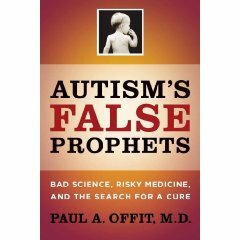 In this book, Paul A. Offit, a national expert on vaccines, challenges the modern-day false prophets who have so egregiously misled the public and exposes the opportunism of the lawyers, journalists, celebrities, and politicians who support them. Offit recounts the history of autism research and the exploitation of this tragic condition by advocates and zealots. He considers the manipulation of science in the popular media and the courtroom, and he explores why society is susceptible to the bad science and risky therapies put forward by many antivaccination activists." 1. Paul Offit has been made wealthy from Rotateq, according to him. 2. A child can tolerate 100,000 vaccines at one time, according to him. 3. In his book summary, he misstates the facts surrounding the death of a child to bolster his argument that biomedical treatment for autism is quackery. So, I just have one simple question. For all the ink Paul Offit gets, how come not a single journalist covered the death of a child from Paul Offit's vaccine? And, I guess I have one more question, this one for Dr. Offit. If a child can tolerate 100,000 vaccines, how did just one of your vaccines kill a child? Below, please find a letter from the FDA to Merck & Co. updating the label to include "death due to intussusception that has occurred after vaccination with RotaTeq®." Attention: Paul L. Koser, Ph.D.
We have received your April 14, 2008, Supplement to your Biologics License Application for Rotavirus Vaccine, Live, Oral, Pentavalent, to include changes to the post-marketing experience section of the label to include a post-marketing report of a death due to intussusception that has occurred after vaccination with RotaTeq®. The patient package insert has also been updated to include this information. This Supplement has been reviewed under STN 125122/443 and is approved effective this date. Please submit all final printed labeling at the time of use and include implementation information on FDA Form 356h. Please provide a PDF-format electronic copy. This information will be included in your License Application File. J.B. Handley is co-founder of Generation Rescue and Managing Editor of Age of Autism.